Having a greens powder loaded with antioxidants makes me feel a little less guilty about all the cookies I eat over the holidays. I particularly like this greens powder because it doesn’t contain a large amount of seaweeds, algae or other ingredients that are high in iodine that could cause inflammatory acne. This greens powder also helps to keep me energized through all the parties and social engagements. This product is available for purchase through my digital dispensary. Click here to create an account. If you stick to no other part of your skincare routine (except daily sunscreen, of course) make time each night to cleanse your skin…I don’t care how busy or tired you are; this is a critical part of your skincare and self-care routine. I recommend purchasing smaller sized products for traveling or decanting your products into smaller bottles. Antioxidants are essential for keeping the skin clear, healthy and glowing. This helps to undo past free radical damage (think sun exposure, environmental pollutants and anything that contributes to cellular aging) and boosts the skin’s regenerative properties. Antioxidant serums also help to prevent the oxidation of the skin’s oils/sebum preventing the development of inflamed acne blemishes. I usually apply my antioxidant serum under my moisturizer and sunscreen in the morning and again in the evening after cleansing the skin. During the hectic holiday season I like to combine my moisturizer with my SPF protection in order to simplify my skincare routine. Unless you have super dry skin, this should be sufficient throughout the day and while you may not think you need sun protection through the cloudy, cold winter months you still need to protect your skin from the damaging UV rays (the clouds only block about 20%). You may also think that you don’t need sunscreen if you are curled up next to a fire indoors but those UVA rays that age the skin penetrate windows putting you at risk of premature aging if you fail to protect your skin. Click here to learn the 7 most common mistakes people make when applying sunscreen. So those are my holiday must-haves for surviving the busy season. 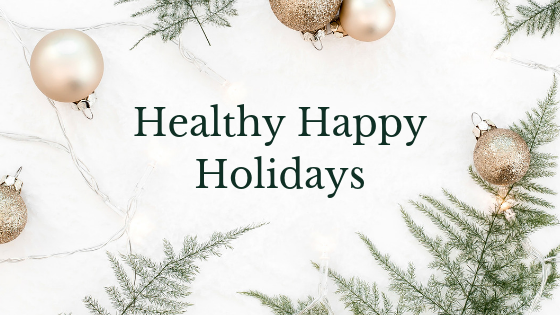 This simple routine will keep the skin healthy and glowing even if you are indulging in too much eggnog, too many late nights and too many gingermen.